I wanted to share some observations and thoughts with y'all on being drawn into the maelstrom of disarticulated atheopathy on Twitter. Although Twitter increased its limit for texts and made some other modifications, I find it very difficult to have a decent conversation on there. Not only because of the limits, but other people tend to get involved. Don't get me started on the cesspool of YouTube comments, except that meaningful exchanges are rare. Especially atheists, who swarm like piranhas. It's the digital version of schoolyard bullying, where they gang up to ridicule Christians and creationists. (Side note: Chris Plante dislikes the word bullying, preferring harassment and other accurate phrases. 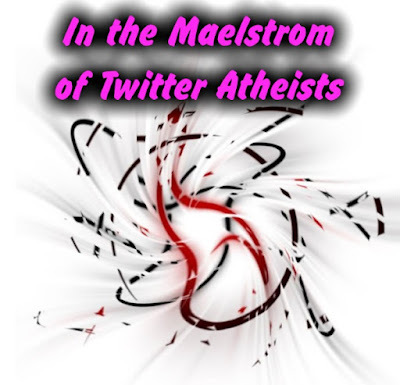 I use it because it shows the childish nature of village atheists on teh interweb.) They were as prideful and irrational as Haywire the Stalker (who has been defeated by me, and others, numerous times, but still spews venom). Since Twitter allows multiple anonymous accounts, these keyboard warriors were free to indulge in excessive profanity and persecution. Come to think of it, internet atheists like Haywire, the Twitter and YouTube blackguards, other "New Atheists" — they're the intellectual and moral equivalent of MS-13, but more feckless. Perhaps if I knew their real names, I could send each one a fruit basket. Better yet, a magnet with The Question Evolution Project on it. It gets confusing because I'm included in exchanges that I was not a part of, and have no idea what is happening with them. However, I did grab this morning's screenshot (July 3, 2018, just after 5 AM) and put it below the video at the end of the article. Well, I have to admit that taunted them for their bigotry and logical failings. I think some were shocked that a st00pid dumb Xtian dared to stand up to The Mighty Atheists™. 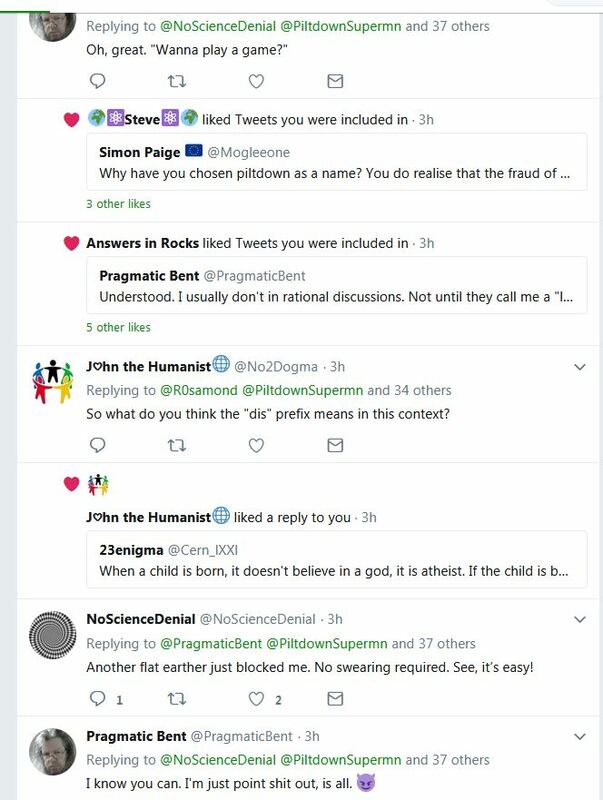 Of course, I was not allowed to be "right" about anything of consequence due to their egos and fragile faith-based positions (it's who they are and what they do), but the Creator they deny knows. As I have said somewhere, if internet atheists were stricken so they could not use logical fallacies, they would have nothing to say. To go further, if they were stricken less drastically, such as from using ad hominem attacks, the genetic fallacy, and straw men, their speech would be curtailed by three quarters. Atheism is incoherent, relying on arbitrary assertions, manipulation, bad logic, a fanatical commitment to Scientism, redefinitions (for example, it has not always been "lack of belief"), putting words in people's mouths and demanding a defense of a position not held or stated, and more. Also, the category error was there: "Prove to me empirically that God exists". What color litmus paper do I use, Skippy? Like Haywire the Stalker, these sidewinders have uniformity of non-thought, and a certain degree of predictability. While they have exceptional arrogance and hypocrisy, internet atheists are actually quite boring. Something I think is a combination of the genetic fallacy and an ad hominem was to attack someone because he apparently lives in a mobile home or a trailer park. (Indeed, I played with the "Location" setting on some weblog posts and put myself in a trailer park. Someone referred to me as "trailer park boy". Good troll took the bait.) A person's domicile is not a legitimate reason to reject his views, you savvy? You can read about some of the fallacies, many with examples, in the list of "Logic Lessons". Anyway, I remember someone saying that, in a group setting, he would ask for one representative and deal with them one-on-one. I don't think that's possible on Twitter. Like YouTube, Twitter is mostly a waste of time. 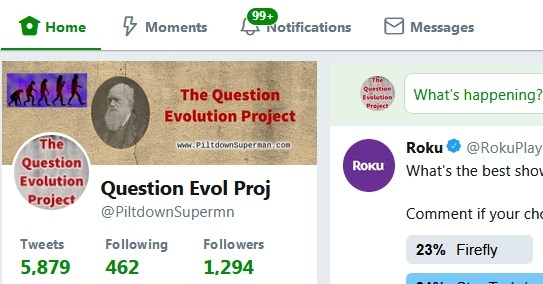 I may have to block a number of them, because my stream was so cluttered with their feculent rants, I could not see legitimate comments, questions, and responses from decent folks. Haywire and other internet atheists need to each drink a glass of dihydrogen monoxide and settle their ownselves down. Annotated screenshots might be helpful, but mockers will not be convinced, and others probably know what I'm talking about. Besides, it would take a passel of time, and I have creation science work to do. I wanted to share this and perhaps let people know what they could be up against on Twitter. Internet atheists hate God and his people, and less vicious atheists don't police their own kind, saying, "Hey, that's not cool!" Ninety percent of atheists give the rest a bad name, you know. Interesting that they seek their identities and purposes in life attacking the God they claim does not exist. Read Romans 1:18-32. Note that "God gave them over", and the list of evil actions as well as the fact that they approve of others who also practice wickedness. I had some interactions, and agree with others that this is casting pearls before swine (Matt. 7:6). They need to repent before their eternity is sealed (Heb. 9:27), but I think they, like Haywire who called God a liar, prefer to increase in hatred.